Special to the Front Porch: Our guest today is John Wilson, Research Director with the Southern Alliance for Clean Energy, with a focus on utility planning, finance and regulation. Less well known is that Duke Energy is also seeking a hair-raising increase in the mandatory fee to $19.50 per month for residential customers. As recently as 2013, the mandatory fee was only $6.75. If Duke Energy’s request is granted, its monthly charge will have tripled in just 5 years! That is not all: Duke Energy actually believes that its monthly charge should be $27.82. Duke is requesting a “smaller increase” to a monthly charge of $19.50 as part of “slowly” migrating towards the target amount. 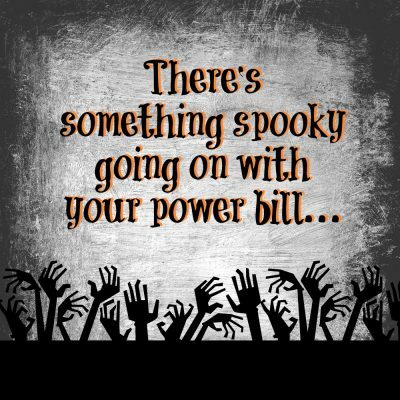 Duke Energy hasn’t said when it would like to start tacking on the additional $8.32, but it probably won’t be on All Saints’ Day. If the North Carolina Utilities Commission accepts Duke Energy’s proposal, what can you do to avoid the “Basic Customer Charge”? Absolutely nothing. It doesn’t matter how much electricity you save or solar power you generate, you still have to pay this mandatory fee to Duke Energy. Is this a fair fee? Duke Energy’s monthly charge increase is being contested by at least three experts who have filed testimony in the rate case, including testimony filed by our attorneys at Southern Environmental Law Center and sponsored by the North Carolina Justice Center, North Carolina Housing Coalition, Natural Resources Defense Council, and the Southern Alliance for Clean Energy. And nationwide, the trend in utility proposals to increase the fixed charge rate is leading to many rejections (see in-depth chart on fixed charge rate trends at end of blog), such as the withdrawal of the Gulf Power fixed charge proposal that SACE contested. Increasing the fixed, customer charge through the imposition of … high customer charge structures creates disproportionate impacts on low-volume consumers within a rate class, such that the lowest users of gas and electric service shoulder the highest percentage of rate increases, and the highest users of utility service experience lower-than-average rate increases, and even rate decreases…. 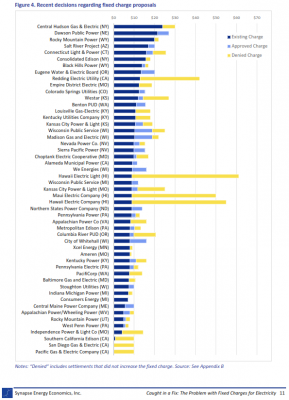 Given these documented usage patterns, the imposition of high customer charge … rates unjustly shifts costs and disproportionately harms low-income, elderly, and minority ratepayers, in addition to low-users of gas and electric utility service in general. 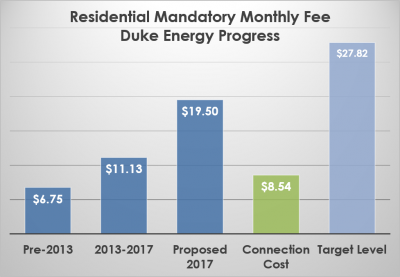 As Duke Energy shifts its bills from a metered rate (per kWh) to emphasize the mandatory fee (per month), customers have less of a financial incentive to save energy. If Duke collects $19.50 per month regardless of energy use, a typical household cutting energy use by 20 percent (with efficiency or by producing its own power from rooftop solar) would result in only about 15 percent bill savings. The reduced incentive to save energy can translate into a significant increase in customer demand: over time, about 2 percent. For comparison, currently Duke Energy Progress is spending millions of dollars to help customers reduce energy bills, and achieving an annual reduction of 0.85 percent in energy demand. The new rates would wipe out about two years worth of residential energy efficiency program accomplishments. Duke Energy Progress profits on both ends of the equation since it earns money on both its energy efficiency programs and on its power plants. Customers who save energy thanks to the energy efficiency programs help Duke Energy earn profits and Duke Energy also profits from selling more power thanks to its new rate structure… and might profit even more if the new demand results in building more power plants. Duke Energy’s mandatory fee target of $27.82 per month is justified by a faulty “minimum system” method. The analysis places usage-related system costs equally on those who use relatively little power and those who use a lot of it. The “minimum system” charge is in contrast to a “minimum connection” charge, which is simply based on the wire to your home, a meter, as well as services like meter-reading, billing, and responding to customer inquiries. As our expert explains, these are the actual costs to connect a customer to the utility system. This 5,767 sq ft home probably pays the same rate for poles, wires, and underground conduits as a two-bedroom apartment. Furthermore, Duke Energy Progress has made changes in this method over the years, such as increasing the “portion of underground conduit costs from 6 percent customer-related to 100 percent customer-related.” These are small, in-the-weeds kinds of changes that most customers aren’t aware of. What this means is that regardless of whether you live in a two-bedroom apartment or a large McMansion, you will pay the same $19.50 monthly charge. So next time you look at your utility bill and see the amount to pay, remember that it is designed to affect your behavior, and maximize profits for the power company. A hearing on the proposed change is scheduled for November 20, 2017 in Raleigh. Will Duke Energy be allowed to gradually erode the incentive to save energy and reduce power plant pollution, or will it move gradually towards a system that discourages waste and gives you more control over your bill? 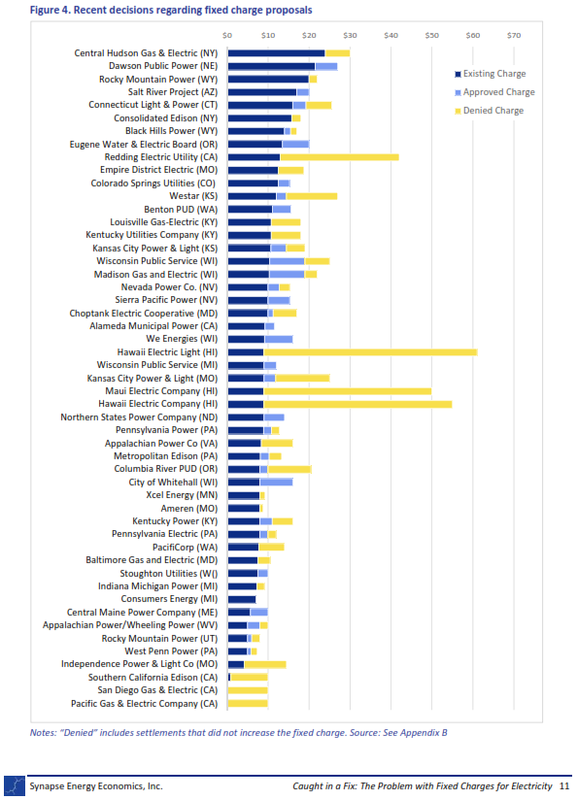 Synapse Energy Economics’ report, “Caught in a Fix: The Problem with Fixed Charges for Electricity” (2016) shows that many proposed fixed charge increases are being denied or reduced.